Surviving Bee Gee mourns Robin Gibb's loss. THAME, England (AP) — Surviving Bee Gee Barry Gibb lamented the loss of his brother, telling mourners on Friday that he would miss Robin Gibb's "magnificent mind and his beautiful heart." He said Robin's death from cancer last month at age 62 means that he would now be reunited with his late twin brother Maurice, who died in 2003. "They were both beautiful," Barry Gibb said. "And now they're together. They're actually together." Many mourners at St. Mary's Church wept as Robin's coffin was brought into the church while the Bee Gees classic "How Deep is Your Love" was played. Robin's widow Dwina and his elderly mother Barbara were close behind. Barbara Gibb has outlived three of her four sons. Singer Andy Gibb, who had a successful solo career, died in 1988. The Bee Gees, known for soaring harmonies and disco tunes, were one of the most popular bands in history. Robin Gibb also enjoyed success as a solo artist and as a songwriter. Crowds of mourners lined the streets of the southern English town before the service as a glass-sided horse-drawn carriage pulled Robin Gibb's coffin to the church. The cortege was followed by Robin's two Irish wolfhounds, Ollie and Missy, along with friends and family. 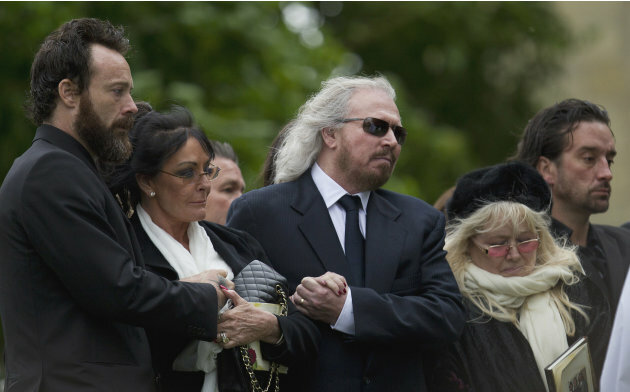 Barry Gibb told the congregation that his late brother Robin's humor was always present, even in times of tension between the two. "We were laughing all the way," Barry Gibb said. "Sometimes crying. God knows how much we argued. Even right up to the end we found conflict with each other, which now means nothing." Guests filed out of the church to the sound of the Bee Gees' song "I Started A Joke," which includes the line: "Till I finally died, which started the whole world living." Gibb was then buried in the churchyard, with a piper playing "Ellan Vannin," the unofficial anthem of the Isle of Man, where the Bee Gees were born. Mourners tossed red roses into the grave. A memorial service is scheduled for a later date.